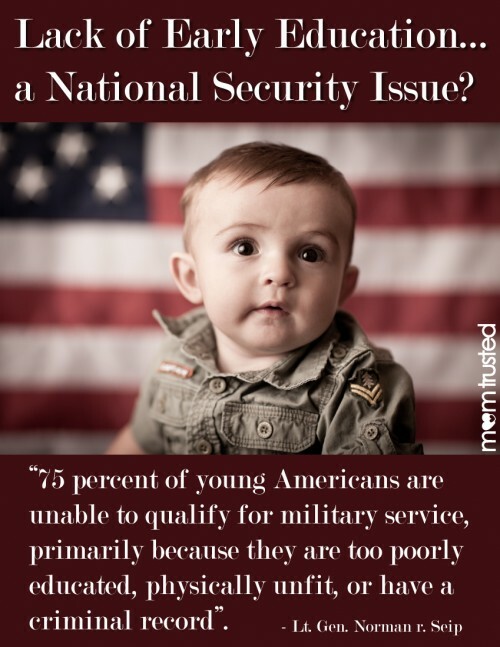 Lack of Early Education…a National Security Issue? Lt. Gen. Norman r. Seip has a very interesting take on the need for early education. He believes that the lack of focus on early education is a national security issue. His reasoning? National security isn’t about aircraft carriers it’s about having enough qualified women and men to fly them. He says that “75 percent of young Americans are unable to qualify for military service, primarily because they are too poorly educated, physically unfit, or have a criminal record”. That’s stunningly high. Check out the article here for the full story.